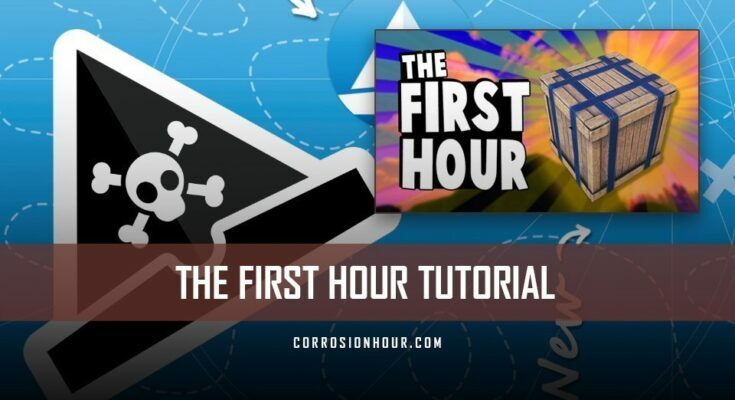 This post covers The First Hour, the third episode in a four-part RUST tutorial series. Welcome to tutorial three in my ultimate Rust tutorial series. Today we’re gonna be looking at three topics. The first is we’re going to look at game settings. I know that doesn’t sound very exciting, but it’s kinda relevant. You should make a few tweaks and understand the keys. Second of all, we’re gonna look at choosing where to live. Third of all we’re going to look at gumping, which is how you get from your spawn beach, I’m on a rather pretty spawn beach, all the way to having a base at least ready to set up. So let’s go through settings first of all, and then crack on with other stuff. Before you do anything fancy like actually play the game let’s whizz through the game settings and ensure everything is working properly. Hit escape and go to the gear icon. In the game settings there are few things you should think about straight away. The first is do you want to mess with your field of view. There are actually ways you can crank this up even higher than the recommended setting it gives you. I’m just going to leave it about that. You can go Google for binds and and commands and console commands amiss with that. The compass at the top of the screen you can turn on or off or put on toggle. Use interface scale, for me on my big monitor, the scale are a little small so I like to drop it down a little bit to point eight. Seems about right. I’m gonna leave the HUD on, and I’m actually going to turn chat off because I want this to be a family friendly video and YouTube probably won’t appreciate some of the chat that would otherwise appear. Branding I’m gonna turn off which is commonly a banner you can find at the top of your screen. Haven’t seen it recently but I’m just gonna turn it off. Name-tags I’m going to leave on. Tips you’ll probably have on, I’m turning them off, they’re not that useful. Maybe leave them on if you’re new. You might have uncensored or pixelated to sit as how you see other players. I’m gonna be putting them on underwear, again, because YouTube doesn’t like seeing naked 3D models. Yeah that’s great. Hide signs is to turn off other people’s content because their signs can be rude. I’m gonna leave that off just because I think it’s gonna be fine as is. The next thing to fiddle with is audio. Now, the music is on right now, but I’m actually going to turn it right off. There’s a couple of reasons for it. The first is that the music will prevent you from hearing the little footsteps of those little sneaks trying to smack the back of your head in with a rock. The second reason is that it’s really creepy. It’s good music, but it’s really creepy and makes me super tense. So I’m just gonna, yeah, both of them can just go away before I cry. I’m gonna turn the game sound volume down a little bit, and just leave the voice volume up a little bit higher. That way people talking will stand out very clearly. That may be a good or bad thing depending on your luck. The next thing I want to look at here is graphics, you can fiddle with all this yourself. I’ve cranked quite a lot of details up, put that one back on, just because I have a world do all of those things. Wow. All of them are on. I have quite a decent computer so that seems like a reasonable thing to do. Input, this is where you can mess around with binds if you want. Just the key controls, should be pretty obvious stuff here. I’m going to talk you through some of this as well, and of course I’m playing the game. So with all of that set how you like it, press escape. One thing I am going to suggest you do straight away is press f1, which will bring you up to the console. There are other bits and bobs in here, none of these will work for you right now, you can’t go creating items unless you create a server typically. But under console you can create a bind command. So I’m gonna type bind, Z, forward colon, sprint. This is going to be very helpful to get around. Now I’ going to hit escape. I am now ready to actually play the game. Just kidding, we’re going to look at the HUD first. First of all, yay look we’re in, woohoo! This is Rust. Wow. Let’s talk about what we can see. Okay, top of the screen there is a compass bar, and as you can see as I turn around the compass turns as you would expect. Bottom right there is a health bar, a food hunger bar, and a hydration bar. You want all those things to be high. If your hydration or your food bar gets too low, the game will tell you that you’re starving, or you’re dehydrated and you’ll start losing health. You’ll also see status effects over the bar. Things like too cold or too hot or comfort if you’re standing next to a fire, that kind of stuff. The chat window will be on the left-hand side, you can hit enter to type and talk to everyone. I have got that turned off for the reasons I stated earlier. And the item bar on the bottom allows you to choose different items based on one, two, three, four, five, six. As you’d expect, holding down wizard will drive you around just like in an FPS. Holding down shift will let you run. But we also have our wonderful Z key, so I’ve just pressed it and now I can run endlessly without tiring out my little finger holding down shift. Soon as I tap W or S again, then there’s eight keys off, so check and I stop. Yeah, very simple. Great for travelling long distances. If you want to jump, spacebar makes you jump. If you want to crouch, hold down CTRL and you crouch. When you’re running if you hit spacebar and jump, you’ll get a little bit extra height if you jump a bit distant from something. If you run right up to a cliff face and press jump, you’ll get some distance, but if you’re back a bit and hit jump you’ll get a little bit more height, so just bear that in mind. And you can jump crouch. I’m not very good at it, but it is possible and that’s how some people get through windows which don’t have bars or shutters on them. It’s important to note that as you run around, you make noise, and that noise does depend on the surface you’re on. So on sand with bare feet and water, on grass, I’m going to have different sound. On stone, if I’m on metal, or other kinds of building tiles and so on. Also depending on the footwear you’re wearing the sound will change. Smart players will hear you creep up on them or run up to them, If you crawl, you can generally get up to people without too much noticing going on. Unless you do something foolish like run or jump or mess around with your inventory. Other useful keys to note are tab, which will open your inventory and it’s where you can drag and drop things from your equip bar, or onto your character. Also, where quick craft items will come up, depending on what’s in your inventory. Tab will remove that. And finally, a cue key will brig up the full build interface or with all the things that it is possible to craft. And even if you don’t have the resources for them, you can see them here. How long they’re going to take to craft, and other information about them. How much protection something gives you, you can see weapons here, and what kind of damage they do and their impact on gathering and that kind of stuff. So when you’re looking at this information you can see the damage an item does. You can see that all gather is gonna gather ore, or if you whack a rock with the club. However, about a bunch of other ore gets destroyed when you gather, so that’s not a great tool for that. If I go across the tools, you can see that a pickaxe is much better for gathering ore and wastes a lot less resources. Likewise, and axe is good gathering trees, less for gathering flesh. That’s important to remember. And you really want to be using the right tools for the job, which we’ll discuss a little bit later on. Chapter 2: Where to Live? So now you’ve had a look at settings, it’s time to talk about where you’re going to live. So the first thing to do is hit G, and to look at the map and find where you are. So I’m over here, so on this map, temperate zones across the middle here, snow to the south, and desert to the north. And I have to think of a few things, where resources are going to spawn. So for example, cloth is all going to be in the grass, I will need cloth. We’re gonna have, I don’t know, maybe useful stuff around the edge of cliffs. I can see there’s some here, rocks like to spawn there, you will want rocks. Trees will spawn mostly in the temperate area, obviously less so in the desert. I am kind of keen to being close to the water. The water is a very good place for newbies to live close to. And I need to think about the size. So I’m looking at sites, and I’m not too fan of this end of the map. There’s nothing really exciting down here. Quarry, and I gas station, that’s the only useful stuff. On the sewer branch here, if I was good at the parkour puzzle on sewer branch that might be tempting because it’s probably a bit quiet down at this end of the map. I have chosen a very quiet server to make things a little easier, and I encourage you to do the same, at least for the very first game if you’re playing solo. At this end of the map is more interesting. There is a river here, which is always good news. The launch site is here, which is a very popular location. The dome is here, and the dome is much easier to run the launch site. And so I’m kind of wondering if this would be good around here, because I’m hoping people will mostly be distracted by launch site. Maybe dome and habour would be left alone. The habour is not amazing, but it’s not terrible, so I’m thinking I’m gonna run over here and try to set up along the beach here. And to do that, I need to figure out which direction it is. So it’s kind of eastish. That’s fine. So what’s important about this is that we’ve decided where we’re going to go, and now we have to think about our route. So I’m gonna try and, I could probably run through this outpost, I’m not going to have any weapons while I’m there. I’ll be protected by the guns, so going through this way is not a bad idea. I might go close to dome, it is a little dangerous. These roads might be a good spot. I might run through harbour actually, might be fairly quiet, might get some loot. So we’ve chosen where to live, and now we need to think a little bit about how we’re gonna get there, and how we’re going to get our base set up and what we’re going to do. So there’s kind of three viable strategies to going from spawn beach, to having a base. So the first strategy, which as a new player you’re at least likely to pull off is the snowball. And that is where you basically just murder people. You find some rookie player who is harvesting resources or running around getting ready to build a base. You murder them, and steal all their stuff. That’s perfectly viable, and plenty of people get bases started that way or gather the gear to snowball onto killing more equipped players, and that gets them more stuff. That’s not what we’re going to do today. The second strategy is to do what I call building and running. And that would involve harvesting resources to make the basic tools, gathering a whole bunch of resources, sort of quite close to spawn beach, and then running to the location and setting up your base. To me, this is prone to failure because this tie standing around. If I’m standing around here and I’m whacking trees and bashing on rocks over here with my rock, and taking a little while, because I’m not getting very many resources while I’m doing this, I’m basically a very good target for someone who wants to snowball. So I don’t prefer to do that. What I prefer to do is the third way. I call that gumping because Pepper the Red, who’s a YouTuber whose content I quite like, he used to do a lot of YouTube, that was his preferred strategy. And what that involves is running across the map, and Pepper the Red describes it as basically running, picking up everything you can as you go, and when you get to a location where you want to stop, that’s when you start worrying about gathering resources that you don’t have already. And the advantage of this strategy is that you’re always moving, and that means that people are generally not going to bother chasing you. You’re hard to shoot because you’re pretty much, as I said, always moving. And you’re not looking like you’re geared up with stuff. You don’t carry any tools, you’re not running across the map all tooled up. And that means that even more chance of you hopefully evading detection or interest because there are other juicier targets out there for the combat hungry people to grab. While you’re running to your destination, you’re keeping an eye out for useful resources. So here’s one, it’s a pile of wood, and it looks pretty much like this everywhere you go. Might be a slight texture change and snow is it? I can’t remember, actually should pay more attention to things. And as I run around, I’m just gonna be gathering up stuff like that. Another type of resource I will find is this little stone spawns like this. Sulphur spawns like this and metal ore spawns like this. Other kinds of resources that spawn in the wild include cloth or hemp, which produces cloth for you. And food boxes, which you’ll find generally near monuments or on junk piles. So here’s a food box, and if I right click on stuff, I pick it up. So here I’ve got a can of beans, a chocolate bar, and some rad pills there. I would only consume if I had radiation, which you would see as a ticking sound there. I wanna generally eat all the food I can, and as you can see, my health has gone up a little bit. My food bar has gone up, which is a good sign as well. Because that shows me that I’m gonna be healthier, heal a little, that kind of stuff. There’s no point in storing that stuff prior to getting anywhere. As you travel you’re likely to come across junk sites, and you’ll find them under these power lines for example, and you’ll find them along roads and around monuments. The only thing you really want to worry about are the boxes and things that you can open quickly. So that was a little red toolbox. I’m just going to ignore pretty much everything else at this stage. Free stuff to pick up. Here’s another crate, I like these as well. And al the stuff we’ll worry about what it is later. For now, you’re just going to grab it and run. In these boxes you might find tools, you might find a bow or some other kind of weapon if you’re very lucky. That’s great. The weapons will end up in your hotbar, and you can select them with the right numbers. And everything else will end up in your inventory. You want to be a little bit careful getting close to some monuments, like well, this one here. That’s radiation – you can hear it really dosed me up there for a little bit. It does, on these monuments, sometimes. Some of them will have little boxes in them, and if you have little red pills on you, you could take a little run to see if you can spot the boxes. No, and then I’ve got my red pills on me and I can hit them and get rid of my radiation poisoning a little bit. While running to your destination you may come across little monuments like this abandoned outpost, or the abandoned cabins. It is not a bad idea to run in here and just grab these boxes with the stuff. There can be good things. Oh look, I got a meat cleaver! So now I am armed, and I’ve got this salvage cleaver. So now that I’ve taken a weapon on my dude now has a sash and I can stab anyone who gets in my face. And so yeah, you will find inevitably some weapons or tools as you go about your gumping. Hopefully no one is here. The more popular the monument, the more likely you are to meet someone. But if you keep running and keep being quick you should be alright. I have come close to the train-yard monument here. Not enough to get radiation, but close enough to find things like these bottles. So having a bottle is handy because I can press 3, and then I can tap my button, tap my mouse button, and have a little drink. If I ran past a river, I could obviously stand in the river and look down, but for now I’m just going to grab this stuff. Empty bottles I’m going to throw away, and I’m just gonna put all the food here and munch it as I travel. If I get up to full health, I would probably just leave the food there. And if anyone started shooting at me and hurt me I would much it because it might give me a little bit of health back, maybe enough to keep me alive. Well the good news is I’ve made it through to the desert without being attacked or molested, and I’ve got a good pile or resources. So let’s talk about what I’ve got here. Wood and stone are my priorities. Sulphur is nice to have a store of, I guess it’s nice to have. Less useful at the start of the game, more useful later on. However, I am very happy to have some I guess. If I had to dump something it would probably be that. I’ve got these tin cans, I’m actually going to keep them. I’ve got these component things for the electrical system, but I don’t really need them. I will probably want to get rid of them. I’ve got other bits and bobs, but my goal right now is to keep running. I’m also looking out for things like caves, as you would have seen in the previous video, caves can offer boxes with tools and other goods in them. So if I did have a cave, that is very handy, and I would probably take a peek into it to see if I could pick up some free tools or other stuff because that’s all stuff I might not have to make later on. What I do want to make straight away is a sleeping bag. So hitting tab to pull up my inventory menu, sleeping bag is immediately selected because I have enough cloth. So I can just whack this, and 30 cloth is consumed, and the sleeping bag is now being crafted. If I clicked the wrong thing I can click my crafting button, which might be Q for you, and I can see under the crafting the current things that are being crafted. I can click that to cancel it, and then the resources appear back in my inventory. So this way, I have it crafting up and I’m gonna keep running while I craft. I don’t need to stop. And I’m gonna gather whatever I can as I go, not pausing an instant, except of course if I spot one of the scientists or blue NPC’s wandering around. I’ve got to be careful because they will be very aggressive, they can shoot me very easily. They can shoot me very easily, and that would be bad for my face. So my sleeping bag is crafted, I’ve grabbed more food, and I’m very close to dome. On any kind of busy server, this would probably be slightly suicidal. Dome is super popular because of the loot spawns on it, and I’m nowhere near equipped to deal with anyone who might want to keep me away from their loot. But I have managed to grab a whole bunch of stuff because this is a very quiet server, and its kinda useful stuff, I guess. So we’re gonna keep running. I’m running this way to the coast. I have got my sleeping bag, and I put it in my slot there, slot three, and I can pull it out at any time, and I can see where I can place it. Because I’m near the monument, I can’t place the sleeping bag down. If I was near someones base, I would get a building blocked message and I wouldn’t be able to place the sleeping bag down there either. So now I’m just gonna run and find a spot. I’m sure it’ll open up soon and let me put it down. And when it does, I’m gonna be able to give myself a new re-spawn location, which will be very handy. Here we go. If I leave it in the middle of the road here, anyone passing by can see it. They can attack it with their weapons or their swords and what have you and get rid of it. So I wanna be a little bit sneaky about it, and I’ll try and put it behind some rocks where people aren’t likely to come, or in a bush. There is actually already a sleeping bag in here? Oh yes there is. It’s another one similar to mine, so I’m going to put mine in here – they’ll get confused hopefully. And if I look at it I can hold down E, and I get different options. I can sometimes, I’m holding down E, I can pick it up, I can give it to some friend on Steam, just start typing in their name, like, I don’t know, moose, sure. Or I can re-name it. And so I’m gonna call this one dome, which is now when I die or if I die, I know I’m going to appear in this location if I choose that sleeping bag. You can put down multiple sleeping bags across the map so that way you have lots of options on where to spawn, obviously the best place is probably in your base and near your base. Good places to spawn if you die. Ooh, I’ve just come across a very lucky item, which is this revolver. I don’t have any bullets for it, but I’m gonna through away my rock and put my revolver there and keep everything else. Oh my, it comes with four bullets? Ah that’s brilliant! Problem is I wouldn’t have any idea how to use it if I was a new player. So right click aims, and then left click shoots. It’s loud, perhaps a little dangerous. I’m now close to the outpost so I better put it away. But that would be very handy. And here is another thing that I really want, it’s metal tools. Gonna throw away, I’ve got two pairs of diving goggles, throw away one of them, and grab that metal tool. It’s going to be very handy later on. So these are the kinds of things you’re gonna find when you’re gumping. And that’s very useful stuff. And we’ll talk about the kind of range of items you can get in a minute. So I have successfully gumped a long way across the map, even though this is a relatively small map because I am on a low pop server. And I’m hanging around in harbour because I know there’s almost no-one online. If you are on a server with 50 or 60 or 100 people on, there’s no way you are going to just stand around in a monument like this. You may even avoid the roads, I mean that’s a risky thing to do. So let’s talk about what we’ve got and how we’re going to make use of the recycler as we go past. Now there are recyclers scattered around a lot of monuments. They are great. Visiting one while you’re gumping is a risk, but for the purposes of this tutorial I’ll show you why you might want to visit one. So here are the resources I’ve got stacked up in my inventory, and we’ll talk about what we do and don’t want to keep. So everything around switches and fuses. There’s a fuse. I’m probably just gonna throw these out but because there’s a recycler here, I don’t need to throw them out. I can just right click and dump them in there. This sheet metal I also don’t need, so I’m just going to blend that up. Tools, there are other tools out there, and I’m gonna want to keep them. This wooden wall I also am gonna throw away. Semi-automatic bodies I want to keep. Scrap I want to keep. The tin cans I will keep for now, if I had to I would throw them out. These metal window bars are a little bit rare, not super rare, but they are a little bit so I’m going to keep them. These I need for weapons, those bits and bobs. These seeds I will throw them out if I have to but I’m not too worried about them. Gears I’m actually likely, no, no, I’m going to keep them. Oh, I think I just broke it – no I just got rid of one. I’m gonna keep them, I might want one for crossbows. Very cool, I might want to use them. Tools like this I’m gonna keep those pickaxe and hatchets. Meanwhile, I’ve got a whole stack of resources out of this. That is a lot of very useful material for a new player to have. Makes me kind of nervous to have this much actually. I’ve got a whole pile of wood and everything else is looking pretty good. My goal really is to be ready to either gather resources with tools that I’ve found, or to have collected – I’ going to get rid of those signs too, I wont need those for a while. So, I want, in here, at least a couple of thousand wood, maybe a little bit more. And I want maybe 3000 stone. That’s gonna be very easy for me to pick up myself just from hammering away at rocks and stuff, but if I can get them running around, great. This much metal fragments right at the start is very good, this high-quality metal is nice, and this scrap is also wonderful. So yes, on a populated server I would now be feeling extremely nervous because that’s a lot of good stuff. The other things you’re likely to find are blueprints, they look like a blue piece of paper, should be pretty obvious. And you can click on them and click learn. I’m gonna talk about what those are later on, but for now I would consider just picking them up and learning them. If you encounter animals while running around, for example, just gonna grab these delicious rocks, these boars – I would probably avoid them. Avoid all animals. You can probably run past a chicken safely, but everything else you should avoid. If you see a wolf… what is that over there? Is that a boar? It is, okay. If you see a wolf, or a bear – run. And they are pretty quick so they might kill you. But if you can run either through rocks, around rocks, over rocks you can over cliffs, you don’t die. You can throw them off your scent a reasonable amount, and you might end up losing them among the rocks. But yes, if you do face them, don’t even try and fight them, even if you have a nice big meat cleaver like this. So I’ve made it to where I’m planning to build, and I managed to do a little cave run and get some even more better loot. I am a little concerned that there is a base sort of pretty much where I want to live already. I don’t understand it. It is very odd. I think someone is having a bit of fun here, this is a quiet server, people like to experiment. I’m gonna leave these guys alone, but I am now going to find my special location. So I am a little bit worried that I don’t have many trees around here, there’s a few, but not that many. However, there are lots and lots of rock nodes, there’s some sulphur nodes, there rock and ore everywhere, so that’s going to be very handy. It’s time to prepare to survive beyond just running around on my own. It’s time to prepare to set up a base, and what I need to do is prepare a couple of things. So the first thing I need to do is to make sure I’ve got a sleeping bag. And the next thing I’m gonna do is make a small stash, and I’m gonna try and hide away some of these goodies. What I will do, oh by the way, I’ve got this little water here. I can drink contents, top myself up. I’m gonna eat this bar and I’m gonna make this sleeping bag. My inventory is now very full. I could go back and scrap these binoculars, but I might just leave them there for now. So I’ve decided that this little area would be quite nice. Relatively close to the beach, which is handy if I want to go out towards the sea and do some raiding. It’s quite close to the habour, which is a friendly newbieish area. Very close to dome, relatively close to the launch site. So for me, on a very quiet server, this seems okay. What I’m going to do now is put down my sleeping bag. So my sleeping bag is going to be stuck again somewhere sneaky. Here we go, it’s looking like I can place it somewhere around here. So I’m going to see if I can place it right there. I’m gonna call this ‘near base’. And the next thing I’m gonna do is make a stash. So a stash is made with a little cloth and what it does is it allows you to hide somer resources away. There goes the sun, night is coming. And hiding resources away can be a very helpful thing to do early on in the game. It’s not a perfect solution, but it is pretty good. So here’s my small stash, and what I’m going to do is put it somewhere near my bag. It might be a little hard to hide. I might put it on the other side of this rock here, right in that little dent there. Somewhere I can remember. What I don’t want to do is for anyone to see me doing this. If they watch me hunched over a rock, they’re going to figure there’s a stash and come along and steal it. Now I can open it and I can put stuff in it that I don’t want. So I can put in like this stuff here, and I can put in the scrap. Scrap is very important, the raw metal frags – very important. Wood and stone I might keep for myself. Any low grade I have, have quality metal, maybe these springs. It’s a bit difficult to know how exactly, or what exactly to put away. Maybe the semi-automatic bodies. I can make multiple stashes, and once I’ve got it all full I can hold E on it, and it will drop into the ground when I choose the hide button. As you can see it’s not there. Hackers will see it, I haven’t, I can’t be sure that I’ve never lost stashes to hackers but I have heard it happens, they can use special tricks. But if I want to find it, I can come back along here, look in this location, and if I’m patient, my stash will come popping back up again and I can access it. But for now I’m just gonna hide it. It’s not a bad idea when you have got to your location and you need to start preparing to start a base to stash a few things. If I put them near my sleeping bag, I’ll always kinda know where it is. But at the same time I will always, always keep an eye on the map, maybe even screenshot it or write it down so I can have a better chance of finding this particular rock. It’s very easy to miss rocks. And as you would have heard, be careful just casually walking past your stashes. If other people, see them they can come along and steal them. So hold E, mouse over hide, and go and tap the mouse button and you’ll be fine. As it stands, we have the tools we need to get on with the next stage, which is to gather the resources to set the base up. We actually have quite a few of the resources we want already prepared, which is great. The tools that we have are a pickaxe for mining out rocks, and a hatchet for chopping down wood. It’s pretty simple. These are tools that I don’t currently know how to make. So if I go to tools list here, it shows you what I know how to make, which is a stone pickaxe and a stone hatchet. So if I click on the stone hatchet here, you can se that it gathers 16, and from ore. It can also gather from flesh, but it destroys a little bit of ore when it gathers. Compare that to my wonderful pickaxe, it gathers 30, doesn’t waste any ore or anything when I is is hitting the rocks. Likewise, this hatchet here is doing very well when I compare it to the stone hatchet, it’s not quite as great. But if you didn’t have tools, if you weren’t lucky enough to find them, you should have the resources on you to make a stone hatchet and a stone pickaxe. You will need one of each. You might get other kinds of equipment, so let me just show you. Op, there goes my torch. You might, if you’re extremely lucky, get a salvaged axe, or salvaged pickaxe. These are even more amazing, they gather very large amounts of trees and ore when you whack stuff with them. But that is going to be a little unlikely, so there are other weapons that you may come across. You may pick up machetes, you may find swords. If you find them, that’s great. You’ll quite commonly find bows. You will also find them with some arrows. We’ll talk about weapons some other time. So your job once you’ve stashed a bit of stuff and have tools – and if you do need to make them then you can just click on them from your quick bar – is to gather resources. And so that’s a very simple job we’ll talk about when the sun comes up. Ah, dawn is here and I’ve made another stash and I’m gonna put it just around the corner from the first one so I don’t accidentally – well oops, I ate the beans, never mind. I’m gonna put it around here, and I’m gonna load it up with my metal ore because I don’t need it right now. And I might put 50 ores with it. I’ll put these semi-bodies in it as well, and all my remaining cloth. First of all, I’m gonna keep this for a second. If you do need to heal yourself and you have cloth, you can tap the bandage button here, and make yourself three bandages. Three bandages will stack in a pile, so if I click this another three times, I’ll end up with six bandages all up. And then we’re going to use one just by selecting it and left clicking. Ah, look at that, I’m bandaging and my health will go up. If someone were in front of me and they were wounded, I could right click and I will bandage them as long as they don’t get too far away. So bandages are very handy. I haven’t bothered to make clothes, and I could make a shirt. I could make – I come into clothing in the menu – in the tab menu for crafting – I can make trousers, I can make all kinds of things. I’m not doing that when I’m gumping because I want to look like I’ve literally just stepped off the beach, and if I put clothes on I might attract attention. It wont exactly keep me alive, unless I’m going through a frozen area, that’s the only time. I’m gonna put that delicious water away, and bury that. So now my inventory is a little bit more clear, and I can actually start to gather. And what I want is stone and wood. So for the wood I’m not gonna pull out this wonderful pistol. I should have put that away, actually. Definitely should put that away, I don’t want to lose that. Just being shot in the back of the head while I’m hitting trees. So I can either use a hatchet, or if I had a stone hatchet I would use that. And I whack a tree, and as you see I get 15 wood and theres a little red X. If I keep hitting the X I keep getting more and more resources up to I think its 20 or a bit higher with this hatchet. And then the tree will eventually come down. I don’t have to hit it, I can hit elsewhere. But as you see, the number goes down, and that makes the whole chopping thing slower. And I wanna try and be efficient, so I’m trying to grab a little bit. And as you can see I got a little bonus amount of wood at the end. And so I’ve ended up with I think about 750 odd wood from all of that. And now I’m up to 2200. Considering I don’t need much more than this, one more tree is probably plenty. Its one of the nice things about gumping is that you can get quite a lot of resources if you’re careful. And I don’t have to make any tools in this case. If you’re playing you might have to make tools. You might need a stone hatchet, you might need a pickaxe, that’s fine. You might not be quite as lucky as I’ve been on t his very quiet server. If you do that’s okay, it’s a little bit more gathering time for you. So that amount of wood is probably plenty for me to get started with a base. I think it should be fine. It’s now time to do the next thing, which is to look for a rock to smack. Fortunately for me, right over here is a rock to smack. So there are different kinds, we’re gonna look at all of them. This is a stone node, get used to seeing it, it’s this shape. And you whack it by clicking and tapping. And I’m trying to hit the star for the same reason that I would whack the tree on the cross of the tree because I get bonus resources when I do it, and the whole rock comes down quicker. It’s important to note that using these metal tools gives me more resources than if I was to use stone tools. And if I had a salvaged tool, it would be even better. But I’m making do with this. If I’d lost this tool at this point, I would be a little sad, but it’s not necessarily the end of the world. I can always make stone pickaxe, I can always make stone hatchet. But I would very much like to keep them so I can research them and then with them researched, I can make these tools myself. So this is a metal node, it’s kind of a low priority for me at this point, especially because I pick up so many little bits of metal while I was running. I am mining it merely for the example for you guys to see, but I would not take any time to bother mining this if I was on a busy server and a bit worried about safety. The final rock type that you’ll see out and about is the sulphur node. It should be pretty obvious. It’s very yellow, very, very important later on later in the game for raiding and what have you, people do value sulphur a lot. For this part of the game not so relevant. Again, just smacking it so you get an idea of what it looks like. But as it stands right now, I have got everything I need to start building a base. What I need to do now is make a few simple things. I need to make a tool cupboard, and it costs a thousand wood. A wooden door, key lock, and another key lock. And as you can see, they’re gonna take a little time to craft. So at this point, I’m probably gonna hide. I might even stash my tools in another stash prepared in advance, put my tools away. With my seeds, I can plant those now. I’m gonna be living in this area, so I can just put them in my inventory hotbar, click like crazy, and I’m just gonna get rid of all of my seeds. If you run around you might also find yourself eating corn or pumpkins as you have seen in the last video. They produce seeds, you can plant those too. Over a little while they will pop up, the plants will pop up and you can harvest them. I also need to make two tools. I need to make one hammer, and one building plan. The wooden door here in this case is a skinned one. It’s got a cool Halloween look on it, that’s fine, we’ll talk about skins another time. But those items, once they’re crafted, you’re ready to start building a base, as long as you’ve got yourself a bit of wood and a bit of stone in your inventory. But we’re gonna cover base building in the next video because it’s quite an involved topic. So I hope you will tune in for the next episode. I’m also gonna be hosting a discussion with some people who build bases on where they like to build, and what kind of bases they like to build. I hope you’ll tune in for those two, they’re kind of optional extras. But until next time, I’ve been TinyPirate, thanks for watching. If you’ve enjoyed this video, give it a like and comment, these things do help the channel. And if you’re feeling super generous, then I don’t know, be a member, or go and make me your favourite creator on the Epic Store. Any of those things would be brilliant, otherwise, just say hi.